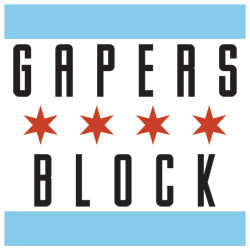 GapersBlock: How did you get the name, The Blind Staggers? Damien Christian: The name came from a Woody Guthrie song entitled "Talking Hard Work," in which he says he has the blind staggers and I thought it was a great band name. It fit us well and we were in the market for a name — it really was just good timing. GB: What are some themes behind your music, and how would you describe your sound? Laura Loo: I think we've got a real honest home grown vibe that comes from spending the mornings after mayhem filled nights trying to figure out how we got home surrounded by empty beer cans and covered in crumbs. But seriously, when it comes to lyrical content we generally write what we know. Our songs can go from being an apology for the grief we've caused others to a lighthearted portrayal of the married life. It all depends on what day of the week it is. Either way, we try to put out music we'd like to hear, and hope that others may share some of our musical tastes. 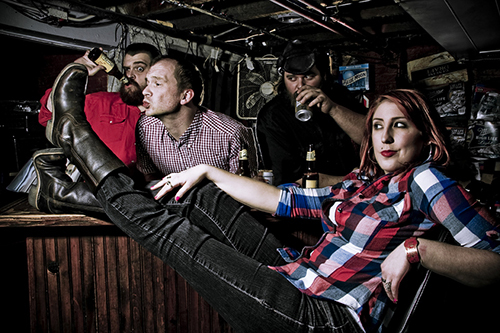 DC: We call it "outlaw love songs." There is a lot of remorse and redemption. It all comes from pretty personal places. We can call it whatever but it's really just American music, storytelling over music. Each member brings a bit of their own influences to the table. Blues, Soul, R&B, Rock/Punk for the end product. But in its conception the songs are mostly an acoustic guitar and two voices which is where I think the tone gets set and what keeps it rooted. If a song can stand-alone like that, I'm usually pretty happy with it. I like to call it an "updated Johnny and June". GB: Where do you get your inspiration from and who inspires you? DC: Life experience, heartaches, and hangovers. As a songwriter, I write things that are personal and I hope other people can relate to and enjoy. Country tinged music is really a great vehicle for it. All my favorite music is heavy on the story or whatever they are saying and the music sets the tone for the mood. Or at least you hope so. Like punk rock. When I was a kid I related to what they were saying. And that is what has stuck with me in my personal style. Although now I take a bit more time in crafting the music. And I have been blessed in this band to play with people who can take my small ideas and turn them in to full songs. But all the country guys like Waylon Jennings, Kris Kristofferson, and Merle Haggard wrote about the stuff I liked. So it seemed like a natural, though not easy, progression from punk rock to something with a bit of a southern drawl on it. LL: When writing lyrics to a song, inspiration can be derived from a number of different places. Whether it is from personal past experiences, future obstacles along the road of life, dreams, aspirations, or simply an idea that pulls at the heartstrings. I don't want to say that the lyrics we have written have any one overwhelming theme but they're generally heartfelt reflections on the lives we have lived and the futures that we'd like to exist in. I'd say I draw and learn more from musicians within my family and group of peers than any real superstars though there is something about seeing Janis Joplin, Grace Slick and Etta James that made the appeal of being a badass rock n roll chick too appealing for me not to try and emulate them. It's hard to say what's generally inspirational but I think it's just those things, those little thoughts or ideas that stick in your head for a while. I can't quit obsessing over those things until putting it into song- it's like closure via melody. Maybe I just need to live in a musical and sing every sentence I speak. 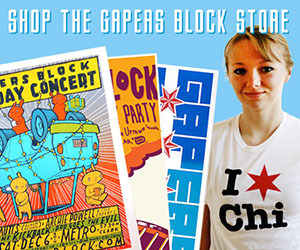 GB: Does the band have a favorite venue to play in Chicago? DC: My favorite is Beat Kitchen, but that's probably because we haven't played The Metro yet. That'd be pretty rad. I do enjoy smaller stages though. A big part of what we do is the interaction between Laura and I. So when the stage is smaller you have no choice but to interact and play off one another because you're right on top of each other, and i think it just helps the stories come across better. LL: I really like to play the Beat Kitchen and Double Door, but then there's something to be said about playing a small venue like the Hollywood — full of our favorite friends and dancin' fools. It's nice when it feels like it's a party and there is no real gap between us and the crowd. It's much more intimate. GB: Being an independent, unsigned band in this day and age is by no means easy. What do you find most challenging when it comes to growing your fan base and spreading your music? LL: Hmm, exactly that. Trying to get people to come to shows and getting our music out there on a more widespread group of people. Things we are definitely still working towards. DC: Being business savvy. Thank goodness for learning from mistakes and making friends along the way, without them we'd be lost. We just try to play out as often as possible and write the best songs we can in hopes that folks who hear our songs like them. It would be nice to be on a label to help us move forward. GB: Describe the ideal future for The Blind Staggers. DC: Traveling, recording a full length and growing a fan base. I know it sounds pretty generic, but that's the goal. Personally I just want to keep writing, playing, and have people enjoy it and relate to it. When that happens i get really stoked and it makes it all worth it. LL: The road baby, the road. We'd all like to be able to see new places and fresh faces each time we play. I love Chicago and all, but I think I speak for all of us when saying that we'd like to be able to play more than once a month. Call us bums, but we just don't want day jobs. The Blind Staggers' next show will be at the Cobra Lounge on May 15th for the Pinups for Pitbulls Benefit with The House that Gloria Vanderbilt, Lord, Elephant Gun, The Wanderers, and American Draft (among others). Doors open at 7pm, show starts at 8pm (21+) with a suggested donation of $10 at the door. Great article and a great band. Very talented, they have a unique sound and are fun to watch. Very entertaining. The Blind Staggers are Chicagolands #1 band.....people just don't know it yet.........so get off your computers and 'git it on with..."The Blind Staggers"! !